In just 8 years, UNIST's bold moves have propelled it to become one of world’s leading science and technology universities. Established in 2009, UNIST has grown to become a world-class university, with a rapidly growing reputation for its research quality and impact across a wide range of discipline fields. According to a recent report based on Scopus data and SciVal analytics, research and teaching at UNIST in its specialist fields of Environmental Sciences, Engineering, and Materials Science are in an excellent position. SciVal, by Elsevier Research Intelligence, is designed to provide research performance metrics, for 4,600 research universities and other institutions in more than 200 countries. 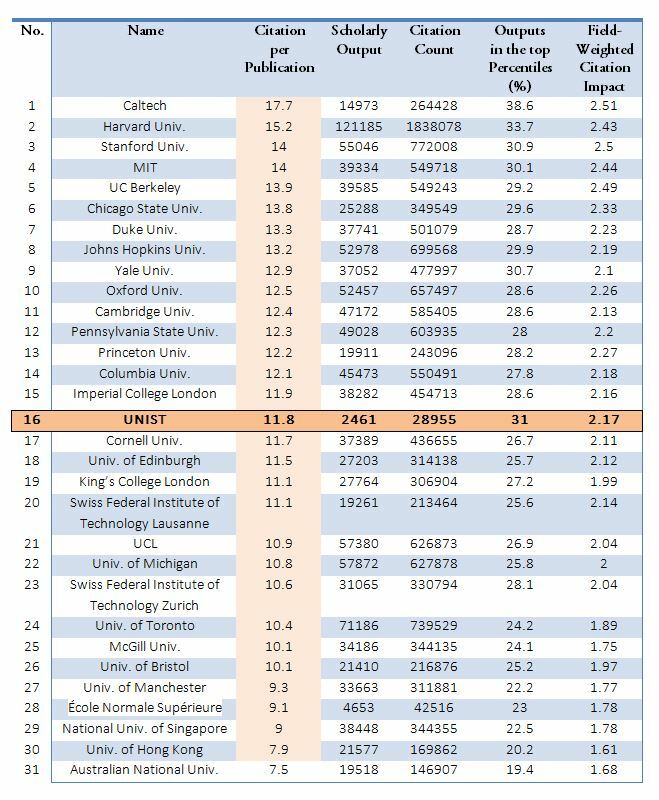 When they measured the rankings based on the numbers of citations received by the average article in the field of Materials Science, UNIST (16.7) surpassed Ivy League schools, such as MIT (15.3) and Harvard University (14.4). 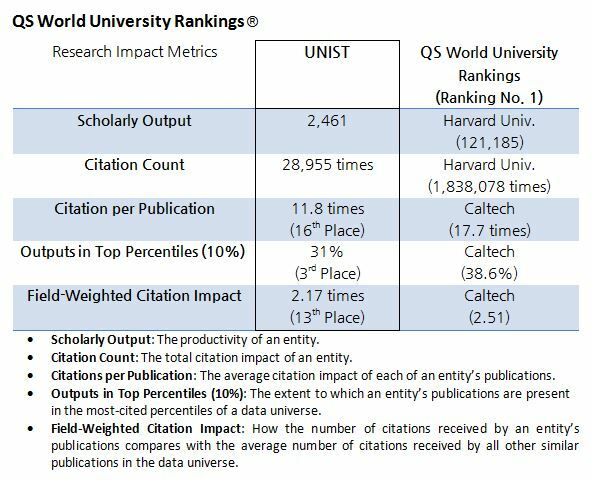 For the field of Environment Engineering, the average number of citations per publication for UNIST was 13.5 and this was higher than those of MIT (12.6) and Harvard University (12.1). Their assessment was based on publication and citation data drawn from Scopus for the past five years (2010-2014) that are affiliated to UNIST. Indeed, in just 8 years, UNIST’s bold moves have propelled it to become one of world’s leading science and technology universities. 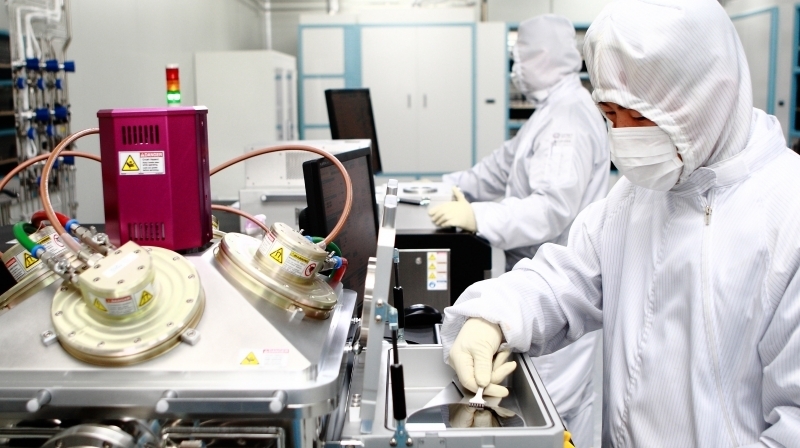 UNIST has been also globally recognized for its outstanding research contributions to lithium ion secondary batteries, along with world’s best universities, such as MIT and Stanford University. Moreover, in a global comparison, UNIST has risen to be among the top 16 universities in the world, according to Quacquarelli Symonds (QS) rankings for 2015/2016 released on Tuesday, September 15, 2015. 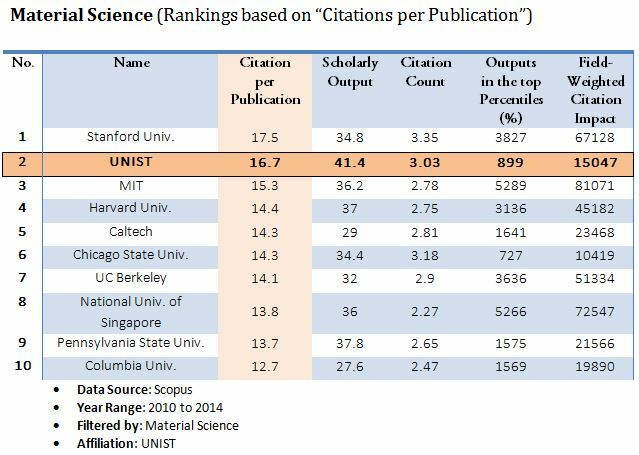 Looking at the figure above, the average number of citations per publication for UNIST is 11.8, which is far higher than that of any other Korean universities. Meanwhile, the California Institute of Technology emerged top in this year’s global rankings, while Harvard University came in second. Stanford University and MIT in the United States took the 3rd and 4th places respectively.